Please please help. I need a quick fix. I had permanent purple hair and I used colour b4 to strip it out and it went back to my natural hair colour being ginger, but my roots went blonde. So I put semi permanent pine green hair dye on top. I has mostly taken, but some of it has gone brown. Is there anyway to fix it without bleaching it all out and starting again? You could spot touch with a brush, or have a friend do it for you. Don't put the dye on your entire head. Hi there! I colour my hair all the time. 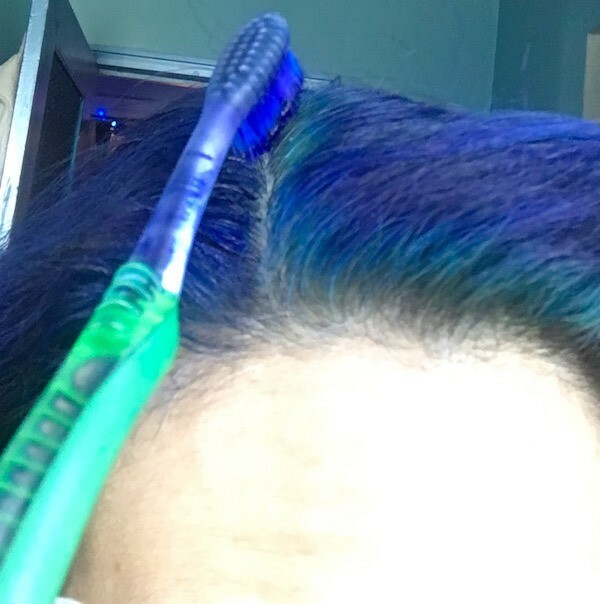 I suggest spot colouring using a used toothbrush to just dab the parts that have gone brown because the bristles are sturdy and the dye won't spread to unnecessary parts. Don't redo your whole head as it will damage it. Here is a photo of me doing just that today. You can see where it has depleted and I am touching it up with the blue dye.